“Buffalo Bill Cody’s Great Scout Ride”, a 5-day tour / 4-day historic horseback ride, is a tribute to the Army scout, bison hunter, pony express rider, ranch hand, wagon train driver, town developer, railroad contractor, fur trapper, gold prospector, and showman. "Buffalo Bill", William F. Cody, was arguably the best known American in the world during his lifetime. Having been involved in many events that shaped the American West, he formed an arena show of the western experience called Buffalo Bill's Wild West in 1883. It toured the United States and Europe for 30 years. After our Sunday and Monday trips to Cody, the Irma Hotel, the Cody Museum and Old Trail Town, our 4-day "Buffalo Bill Cody's Great Scout" riding adventure begins Tuesday at the location Buffalo Bill Cody chose in 1901 as the site of his hunting lodge (the historic Pahaska Lodge) at the confluence of the Middle Fork and North Fork of the Shoshone River that sits in the Shoshone National Forest (which became our nation’s first National Forest in 1891). The Middle Fork of the Shoshone River begins in Yellowstone National Park and flows nearby just as it did in 1895 when Buffalo Bill followed it on horseback to Sylvan Pass to confirm an easterly route into Yellowstone. We will ford the North Fork of the Shoshone River (named ‘Stinking Water’ by mountain man John Colter) numerous times during our adventure. • Prince Albert II of Monaco – 2013 to commemorate 100 years since great his grandfather’s visit. Surrounded by the beautiful Shoshone River and pristine and fire ravaged forests, we’ll climb the trails that wind up to majestic mountain meadows allowing us spectacular views of Wapiti Valley, of mountain peaks rising over 10,000 feet, and of fast rushing mountain streams and to the historic Cody Peak, Sam Berry Meadows, Grinnell Creek and Crow Creek. Due to the presence of wildlife (such as deer, moose, antelope, buffalo and bear) we ask that no personal dogs join us on our ride. 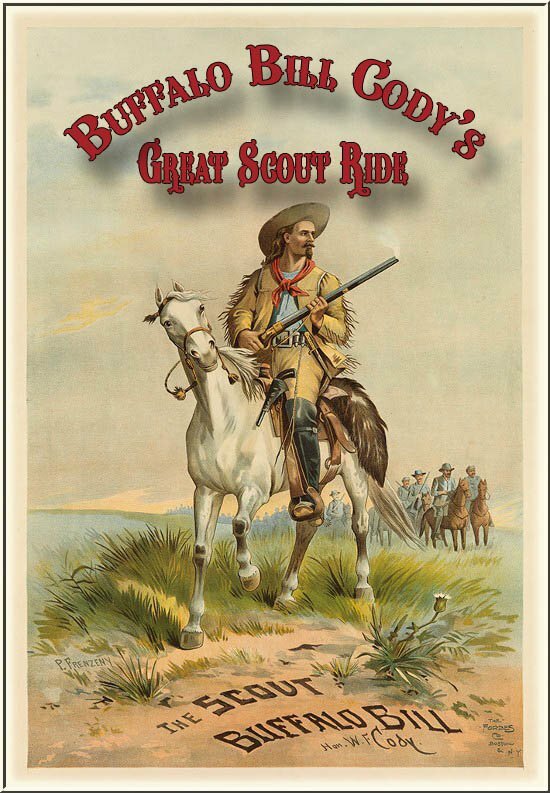 OUR BUFFALO BILL CODY’S “GREAT SCOUT” ADVENTURE BEGINS….. The Irma is a step back in time... into the Old West – a place Buffalo Bill called "a gem" and "just the sweetest hotel that ever was". Bill built the hotel in 1902 and named it for his youngest daughter, Irma. Today, you can stay in historic rooms that housed some of the most famous personalities the world ever has known, including Frederic Remington, Annie Oakley and Calamity Jane. You can even stay in Buffalo Bill's private suite. There are a host of other historic or non-historic rooms, all with up-to-date amenities and air conditioning. Here lies the romance of an era when Buffalo Bill's Wild West Show try-outs were held on the lots west of the hotel, when buffalo ran amok in downtown Cody, and when European nobility headquartered at The Irma while on hunting treks in the area. Buffalo Bill helped found Cody, Wyoming, in 1895. He also established his TE Ranch in the area. The Irma was built to appeal to visitors from around the world -- as a staging point for sightseers headed for Yellowstone, big game hunters, summers tourists, and businessmen investigating the ranching, mining, and other business opportunities. Buffalo Bill maintained two suites and an office at the hotel for his personal use. When the Burlington Railroad completed a spur line into Cody, Buffalo Bill's plan was to have travelers stay at his hotels in the Rockies on their way to the east gate of Yellowstone National Park. They included The Irma Hotel in Cody, near the railroad; Wapiti Inn (a day's wagon ride west); and Pahaska Teepee (our headquarters for the week) near the East gate of the Park. The Irma is listed on the National Register of Historic Places by the National Park Service in recognition of its contribution to the cultural foundations of America. The Irma's famous Cherrywood bar, a gift from Queen Victoria, dates to the period of construction and is one of the most photographed features in all of Cody. The original part of the hotel was built for Buffalo Bill in 1902. The northwest addition was constructed in 1929, and the southwest addition was added in 1976-1977. The Buffalo Bill Center of the West, formerly known as the Buffalo Bill Historical Center, is a complex of five museums and a research library featuring art and artifacts of the American West. 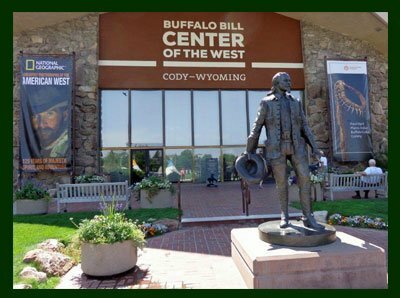 Founded in 1917 by Cornelius Vanderbilt Whitney to preserve the legacy and vision of Col. William F. "Buffalo Bill" Cody, the Buffalo Bill Center of the West is the oldest and most comprehensive museum complex of the West. It has been described by The New York Times as "among the nation's most remarkable museums." Houses the most comprehensive collection of American firearms in the world. The Winchester Arms Collection is the heart of this museum. To date, the Cody Firearms Museum has over 7,000 firearms with more than 30,000 firearms-related artifacts. Winchester-made guns are not the only manufacturer you will see here, though; virtually every significant manufacturer in the world is represented! Contains artistic masterworks and exciting modern views of the land, people, and wildlife. Visitors experience the Spirit of the American West through exquisite paintings and sculptures. Tracing its roots to 1917, the Buffalo Bill Museum is the flagship museum of the Buffalo Bill Center of the West. First opening its doors to the public in 1927 in a log cabin in downtown Cody—modeled after Bill Cody’s house at his “TE Ranch”—southwest of town, the museum remained in that location until 1969 when it was relocated to a newly-built wing of the then Buffalo Bill Historical Center. Here, as in its original incarnation, the Buffalo Bill Museum’s focus is on the life and times of William F. “Buffalo Bill” Cody (1846 – 1917), the noted guide, scout, frontiersman, showman, actor, entrepreneur, town founder, and American icon. Positioning the story of Cody’s life within the context of the history and myth of the American West, the museum documents how, in an age without television or motion pictures, and under the persona of “Buffalo Bill,” Cody became the world’s foremost communicator about the history, promise, and enduring spirit of the American West. William F. “Buffalo Bill” Cody was born just west of the Mississippi River near LeClaire, Iowa, on February 26, 1846. At age 12, he worked for a wagon train headed to Fort Laramie, Wyoming; the next year, he participated in the gold rush to Colorado; and at 15, he reportedly rode for the Pony Express. By the end of his life, he had come to symbolize the American frontier itself. Cody served as a scout for the Union Army’s Seventh Kansas Cavalry during the last years of the American Civil War. On March 6, 1866, he married Louisa Frederici (1843 – 1921) in St. Louis, Missouri. They had four children: Arta Lucille (1866 – 1904), Kit Carson (1870 – 1876), Orra Maude (1872 – 1883), and Irma Louise (1883 – 1918). U.S. Army General Philip Sheridan saw in Cody a combination of charisma and frontier know-how—a natural “public relations windfall” for the Army of the West, which was in need of some good publicity. 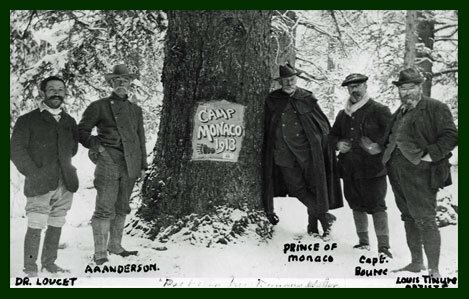 Under the protection of the Army, visiting dignitaries, such as the Grand Duke Alexis of Russia, took lavish hunting expeditions accompanied by General Sheridan and Brevet Major General George Armstrong Custer with Buffalo Bill as their guide. These excursions were full-scale media events, glamorizing both the military and Cody. During this time, the pulp fiction industry produced inexpensive magazines that romanticized the exploits of the heroes and villains who roamed the plains—including Buffalo Bill, a central figure of many of these inflated truths. 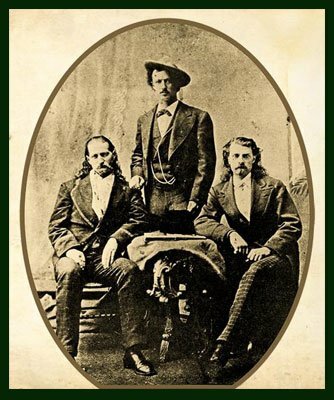 In 1872, dime novel writer Ned Buntline persuaded Cody to portray himself on stage. The “show business bug” hit Cody, and he formed his own “combination” troupe the next year. The group also included James Butler “Wild Bill” Hickok and Texas Jack Omohundro, authentic western characters who gave some credence to the melodrama. During the height of the Plains Indians resistance to white settlement, Cody returned to the prairies in summer 1876 to scout for the Fifth Army. On July 17, 1876, just three weeks after Custer and the Seventh Cavalry were defeated at the Battle of Little Big Horn, Cody’s regiment intercepted a band of Cheyenne warriors. When Buffalo Bill, in his stage clothing, killed and scalped a Cheyenne warrior named Yellow Hair (often mistranslated “Yellow Hand”), he reportedly cried out “First scalp for Custer!” Buffalo Bill the frontiersman had proved that Buffalo Bill the character was no mere actor. In 1883, Cody created what would become Buffalo Bill’s Wild West, a grand performance that propelled him to fortune and worldwide fame. The Wild West was staged, in one form or another, for thirty years, playing to enthusiastic crowds throughout the United States and Europe. In Europe, Cody was called “Nature’s Nobleman” because he was someone who had grown up on the frontier yet represented all of those best aspects of civilization. Despite his characterization as a figure from the past, Buffalo Bill always looked to the future. As a businessman, he invested in projects that he hoped might bring economic growth to the West. With his earnings, he invested in an Arizona mine, hotels in Sheridan and Cody, Wyoming, stock breeding, ranching, coal and oil development, film making, town building, tourism, and publishing. In 1899, he established his own newspaper, the Cody Enterprise, which is still the main source of news for the town of Cody today. Taking advantage of his celebrity status, Cody was an early advocate of women’s suffrage and the fair treatment of American Indians. After our visit to the Buffalo Bill Center of the West, we literally head west, toward Yellowstone. Along the way, time permitting, we’ll stop at Old Trail Town. This is a collection of historic western buildings and artifacts, dating from 1879–1901. Much of the collection was derived from within 150 miles of Cody. On this site in 1895, Western scout and showman William F. ("Buffalo Bill") Cody laid out the original townsite of Cody, Wyoming, which was named in his honor. 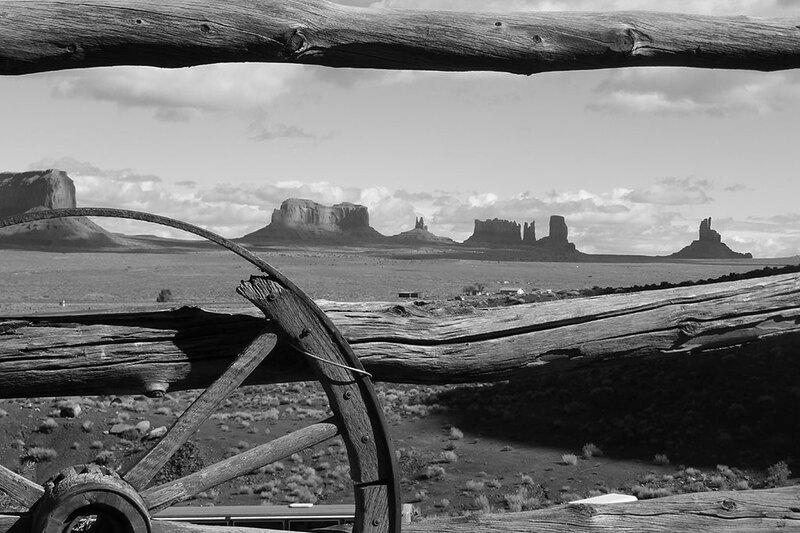 Today Old Trail Town preserves the lifestyle and history of the Frontier West through a rare collection of authentic structures and furnishings. From remote locations in Wyoming and Montana these historic buildings were carefully disassembled, moved and reassembled here at Old Trail Town by Western historian Bob Edgar and friends. Located here also are thousands of historic artifacts from the Old West and grave sites of several notable Western figures. Among them is the grave of mountain man John Johnson, who was portrayed by the actor Robert Redford in the 1972 motion picture "Jeremiah Johnson". Here too are original cabins used by Old West outlaws Butch Cassidy and the Sundance Kid and a Wyoming saloon frequented by Cassidy's "Hole-in-the-Wall Gang". Also on this site is the log cabin home of "Curley" a Crow Indian army scout who helped guide Lt Col. George A. Custer and the U.S. 7th Cavalry to the battle of the Little Big Horn in 1876. Old Trail Town exists today as a memorial to the uniquely American experience known throughout the world as "the Old West". Afterwards, drive a bit further west, check-in to our headquarters for the rest of the week, Pahaska Tepee. Buffalo Bill’s Original Lodge at the Eastern gateway to Yellowstone is nestled amongst the tall pines just east of Yellowstone Park at the foot of majestic Cody Peak, with THE best location just outside of Yellowstone's East Entrance. It is unquestionably the most scenic entrance to Yellowstone National Park. All the rooms are cabins equipped with modern heating systems, comfy pillow-top beds, private baths, and telephones. The remote mountain location provides no cell service or cable television, so no TV's in the rooms. Limited satellite internet access is available near the main lodge. All of the rooms are designated non-smoking. The 2 queen and 1 Queen/1 Twin rooms can facilitate a rollaway bed if booked with the reservation. Historic Pahaska Tepee, which lies in the middle of the Shoshone National Forest, was the original lodge built by Colonel William F. “Buffalo Bill” Cody at the turn of the century. Buffalo Bill frequented the area on hunting trips in the 1880’s. Twenty odd years later he returned and led the development of Yellowstone’s East Entrance. Buffalo Bill believed that once word got out about the incredible mountain scenery and abundant wildlife of the spectacular Wapiti Valley, the Cody road would soon become the most popular entrance to Yellowstone. In 1917, motorized vehicles were admitted to Yellowstone and Pahaska grew into a mountain village welcoming Park visitors as it still does today. By 1923, the East Entrance’s scenery and close proximity of roads to the East made it the busiest entrance to the Park. Today the Old Lodge still stands in all of its glory. Walking in the front door of the lodge is like walking into another era. Every facet of the original building is preserved in every detail. The deep golden brown logs and the historic architecture of the two story structure come together for an experience right out of the heart of the old west. You can almost hear the stories and lore that have been spun in the building over the years. • Travel Insurance – this is highly recommended. Request a free insurance quote. • Though not mandatory, dressing “period” makes these rides more fun and makes for great photos ops!! Try it! Don’t spend lots of money unless you want to… Dress Code recommendations / where to purchase under “About” dropdown menu above site. This historic lodge was built from native timbers in the early 1920's by Cody's first county sheriff, Henry Dahlem. The building is a beautiful display of craftsmanship and history which features full service dining room and lounge. The lodge is the main gathering place for road weary travelers to take the time to sit and enjoy the warmth of the fire in the historic hearth built from stones collected by the original family members. Or on warm summer evenings they might choose to sit in one of the rockers on the front porch and listen to the brook trickling through the courtyard while watching for local wildlife that may wander through. 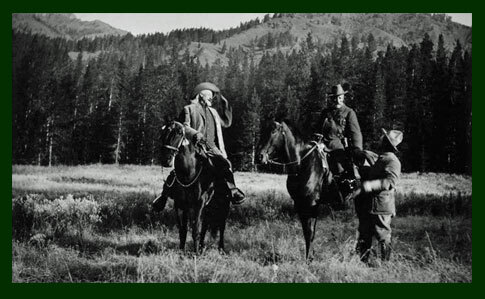 “Buffalo Bill Cody’s Great Scout Ride”, a 5-day tour / 4-day historic horseback ride, is a tribute to the Army scout, bison hunter, pony express rider, ranch hand, wagon train driver, town developer, railroad contractor, fur trapper, gold prospector, and showman. “Buffalo Bill”, William F. Cody, was arguably the best known American in the world during his lifetime. Having been involved in many events that shaped the American West, he formed an arena show of the western experience called Buffalo Bill’s Wild West in 1883. It toured the United States and Europe for 30 years. After our Sunday and Monday trips to Cody, the Irma Hotel, the Cody Museum and Old Trail Town, our 4-day “Buffalo Bill Cody’s Great Scout” riding adventure begins Tuesday at the location Buffalo Bill Cody chose in 1901 as the site of his hunting lodge (the historic Pahaska Lodge) at the confluence of the Middle Fork and North Fork of the Shoshone River that sits in the Shoshone National Forest (which became our nation’s first National Forest in 1891). The Irma is a step back in time… into the Old West – a place Buffalo Bill called “a gem” and “just the sweetest hotel that ever was”. Bill built the hotel in 1902 and named it for his youngest daughter, Irma. Today, you can stay in historic rooms that housed some of the most famous personalities the world ever has known, including Frederic Remington, Annie Oakley and Calamity Jane. You can even stay in Buffalo Bill’s private suite. There are a host of other historic or non-historic rooms, all with up-to-date amenities and air conditioning. Here lies the romance of an era when Buffalo Bill’s Wild West Show try-outs were held on the lots west of the hotel, when buffalo ran amok in downtown Cody, and when European nobility headquartered at The Irma while on hunting treks in the area. Buffalo Bill helped found Cody, Wyoming, in 1895. He also established his TE Ranch in the area. The Irma was built to appeal to visitors from around the world — as a staging point for sightseers headed for Yellowstone, big game hunters, summers tourists, and businessmen investigating the ranching, mining, and other business opportunities. Buffalo Bill maintained two suites and an office at the hotel for his personal use. When the Burlington Railroad completed a spur line into Cody, Buffalo Bill’s plan was to have travelers stay at his hotels in the Rockies on their way to the east gate of Yellowstone National Park. They included The Irma Hotel in Cody, near the railroad; Wapiti Inn (a day’s wagon ride west); and Pahaska Teepee (our headquarters for the week) near the East gate of the Park. The Irma is listed on the National Register of Historic Places by the National Park Service in recognition of its contribution to the cultural foundations of America. The Irma’s famous Cherrywood bar, a gift from Queen Victoria, dates to the period of construction and is one of the most photographed features in all of Cody. The original part of the hotel was built for Buffalo Bill in 1902. The northwest addition was constructed in 1929, and the southwest addition was added in 1976-1977. On this site in 1895, Western scout and showman William F. (“Buffalo Bill”) Cody laid out the original townsite of Cody, Wyoming, which was named in his honor. Located here also are thousands of historic artifacts from the Old West and grave sites of several notable Western figures. Among them is the grave of mountain man John Johnson, who was portrayed by the actor Robert Redford in the 1972 motion picture “Jeremiah Johnson”. Here too are original cabins used by Old West outlaws Butch Cassidy and the Sundance Kid and a Wyoming saloon frequented by Cassidy’s “Hole-in-the-Wall Gang”. Also on this site is the log cabin home of “Curley” a Crow Indian army scout who helped guide Lt Col. George A. Custer and the U.S. 7th Cavalry to the battle of the Little Big Horn in 1876. Old Trail Town exists today as a memorial to the uniquely American experience known throughout the world as “the Old West”. Buffalo Bill’s Original Lodge at the Eastern gateway to Yellowstone is nestled amongst the tall pines just east of Yellowstone Park at the foot of majestic Cody Peak, with THE best location just outside of Yellowstone’s East Entrance. It is unquestionably the most scenic entrance to Yellowstone National Park. All the rooms are cabins equipped with modern heating systems, comfy pillow-top beds, private baths, and telephones. The remote mountain location provides no cell service or cable television, so no TV’s in the rooms. Limited satellite internet access is available near the main lodge. All of the rooms are designated non-smoking. The 2 queen and 1 Queen/1 Twin rooms can facilitate a rollaway bed if booked with the reservation. This historic lodge was built from native timbers in the early 1920’s by Cody’s first county sheriff, Henry Dahlem. The building is a beautiful display of craftsmanship and history which features full service dining room and lounge. The lodge is the main gathering place for road weary travelers to take the time to sit and enjoy the warmth of the fire in the historic hearth built from stones collected by the original family members. Or on warm summer evenings they might choose to sit in one of the rockers on the front porch and listen to the brook trickling through the courtyard while watching for local wildlife that may wander through.